Draft ‘DR2 AS/NZS 5139:2019, Electrical installations — Safety of battery systems for use with power conversion equipment’, has been made available and the standard will be released in the coming month(s). After looking over the draft we’ve prepared the snapshot below with some of the key items. Before the 3/4/2019 you can download the draft here or go to our Resources page. After reading this standard and speaking our industry colleagues, we are reminded that all electricians who are selling/installing battery systems should check they have the appropriate training and are up to date with relevant standards. Refer DPA Training. Disclaimer: We note that this isn’t intended to be a full and complete outline of the standard, rather just our 2-minute summary of our thoughts on the key concepts of the standard. 1. Scope of AS/NZS 5139: – As per the scope section the standard does not apply to: some sites with critical continuity requirements (Hospitals/substations etc), UPS systems (use AS 62040), Vehicles or mobile applications. The standard does apply to systems over 1kWh and less than 200kWh with lead, lithium or other chemistries and systems in the voltage range 12v to 1500v dc. 2. Best Practice Guide. 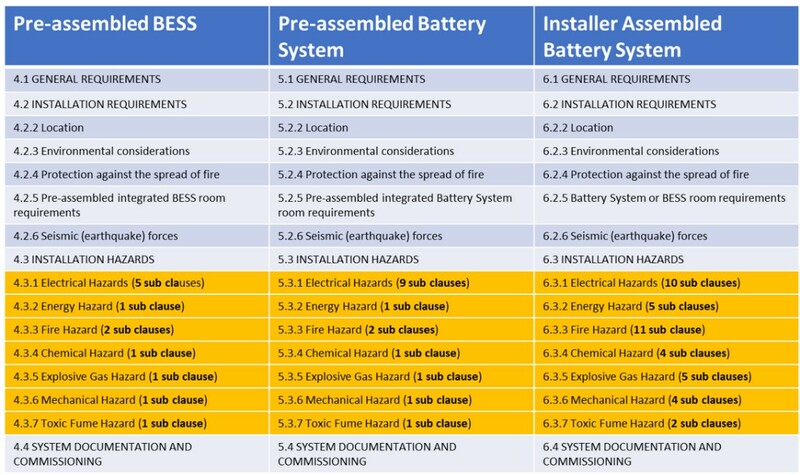 This std refers a second document called the Best Practice Guide (40 page doc) prepared by industry partners for manufactures, assemblers or importers of household battery equipment to self-assess their systems against. It could be assumed that these parties will advertise such compliance to market their product and reduce work for installers. Electricians can also self-assess systems and keep records of resulting compliance. 3. Categories/Terminology. Starting out with the basic terminology first. Next, the standard refers to 3 categories. The first two are Pre-assembled compliant categories, the third is for non-compliant, installer assembled systems. The standard has a nicely prepared table showing the headings repeated under each section. We note that the number of pages for sections 4, 5 and 6 is around 10, 20, 50 respectively. 4. Don’t install in: ceiling spaces, wall cavities, on roofs*, under stairs/access walkways. And not in habitable rooms in domestic/residential sites. 5. Habitable Rooms: If mounted on the outside wall of a habitable room in domestic/resi-sites, all requirements in the appropriate sections must be met, including spread of fire sections. 6. Risk Assessment – You will need to complete a risk assessment as per templates provided in Appendix G of the std, address risks accordingly and save in the documentation package. 7. Installation Hazards: These include: Electrical, Energy (Arc Flash calculations), Fire, Chemical, Explosive Gas, Mechanical and Toxic Fme identification. This std should also be read in conjunction with AS/NZS 3000 and AS/NZS 4509 for off-grid, AS/NZS 4777 for on-grid, as well as all the others.